I have recently returned to legal studies, and in my lectures, we’re told to summarise our point at the start of giving advice to a client. This seems like a good idea for writing in general so to start I will simply say this: Etto is serving some of the best food I have tried in Dublin. Walking home along Merrion Row on Wednesday evening, I noticed a bustling new restaurant a few doors down from Bang and The Unicorn. 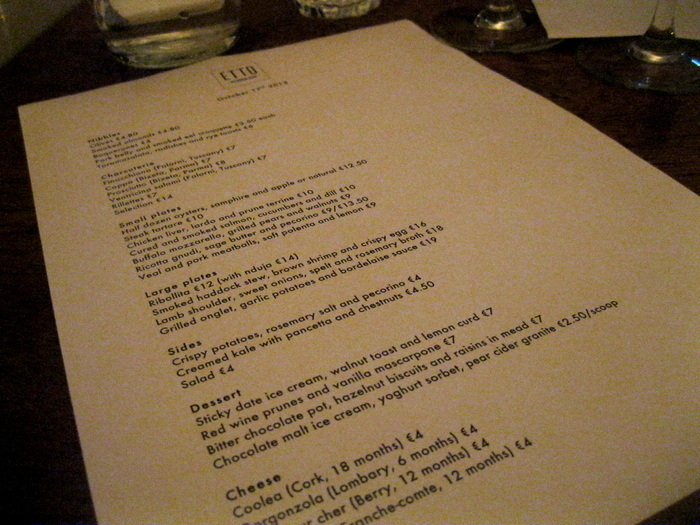 An hour later, I saw a an update on Facebook from Coppinger Row for Etto’s opening night. A family dinner was in the formative planning stages for the following evening, and I steered it in the direction of Etto after a look at the unusual menu. Etto is run by Simon and his partner, Liz, have recently returned from London, and it shows in the innovative food and lovely interior design. The space is small but carefully thought out with a wine bar area at the back and restaurant at the front with distressed vintage tables, and white walls. The Borough Market favourite of Nduja features in dishes on both the lunch and dinner menu. Good quality ingredients are used in simple but unusual ways throughout with nods to Italian, Dutch and Scandinavian influences. Between four people we managed to sample quite a lot of the menu. There wasn’t a single dud among the dishes we tried. 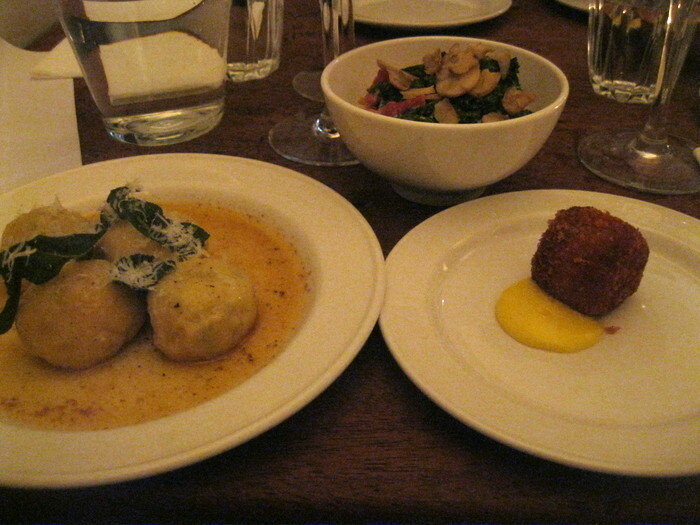 I went for ricotta gnudi with brown butter and sage, creamed kale with pancetta and chestnuts. At the last minute a smoked eel and pork belly croquette was added out of sheer curiosity. The ricotta were light in texture and rich in flavour, perfectly accompanied by the brown butter and fried sage leaves. The croquette consisted of lightly bound cubes of pork belly and tasted pleasantly smoked without an overwhelming taste of eel (i’m not the biggest fan of eel) . The perennial health food favourite,kale, was turned into a rich and nourishing dish with crispy chunks of pancetta and slices of chestnut. I also had a taste of my families choices of chicken liver, prune and lardo terrine, veal and pork meatballs, steak tartare, triple cured salmon, mozzarella with grilled pears and walnuts, crispy potatoes with pecorino and aioli. They were all absolutely outstanding, especially the meatballs which were beautifully juicy with little chunks of meat rather than completely minced. Although the dishes look small, they are very filling. 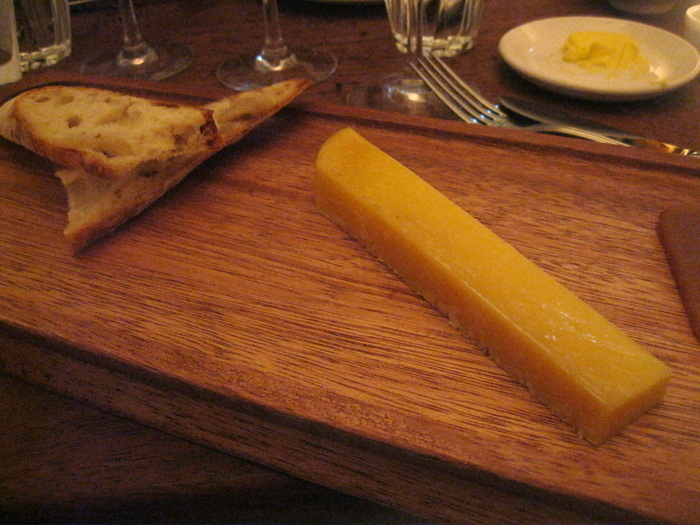 I finished off with a generous slice of gorgeous Coolea cheese served at the perfect temperature along with a slice of quince jelly. It was so good, my cheese hating brother actually asked for a second taste. Simon came and explained the great wine list to us. Along with lots of unusual wines, Etto has excellent house wines and prosecco on tap! The wine is stored in a special cask which keeps it ready to drink for sixty days. Fingers crossed some Dublin bars follow suit, wine on tap is just a fantastic idea. We went for two Spanish red wines, a Garnacha called ‘Plic, Plic, Plic’ and the unusual ‘Gaba de Xil’. Everyone working there was friendly and enthusiastic, and although we had one ordering glitch, it was swiftly remedied. The bill came to €163 for four people for a really exceptional meal. If you try one place in Dublin, this is the place to try. This entry was tagged Dublin, Ireland, restaurant, travel. Bookmark the permalink. I must try Etto. I had dinner in Bang last night. Exceptional food there too and a great buzz. Welcome home! Thanks. I haven’t been in Bang for many many years, but it used to be a family favourite. I’ll have to give it a try again. Love finding new places. Dublin has a lot of restaurants opening at the moment, something to do with recession sparking creativity. I’m sure your recipe is great, I’ve never had the courage to try making gnocchi or gnudi, always afraid they’ll end up stodgy. It all sounds very tempting– especially the gnudi (yum). Thanks for sharing a great find!